Everyone who is interested in establishing savings for retirements always tries to compare Roth IRA accounts to 401K plans to figure out which types of investments will bring optimal retirement cash flow in the future. Both Roth Ira’s and 401K’s are great tax saving tools to invest in your retirement funds, however deciding which one you should go for depends on your individual situation. We hope that main characteristics of these retirement accounts that we draw up below will help you gain more understanding and compare Roth IRA vs 401K plans. – Roth IRA contributions are not tax deductible and are considered after tax money; however future earnings and gains within this plan are absolutely free of tax. – In order to participate in a Roth IRA plan, you need to meet certain income requirements – a single person’s income can not exceed $120K and married couple’s joint income can not be higher than $177K to qualify starting in 2010. 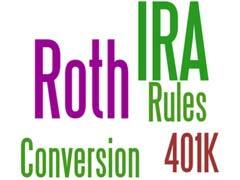 – Roth IRA contribution limits are strictly regulated by law and were established to be $5K for years of 2009 and 2010 for individuals younger than 59 ½ and $6K for older participants. – Some Roth IRA providers will give you an option of no fee Roth IRA which is a great option to take advantage of to save you money that could be put towards your retirement investments. – Self-directed Roth IRA presents a great opportunity of financial freedom to choose alternative investments besides common stocks, bonds and securities. – Roth IRA’s offer penalty-free withdrawals if you initiate them after 5 consecutive years of contributions and within your contribution levels. In other words, you will only be able to withdraw the actual money you put in and not the earnings before you reach the age of 59 ½ without paying penalties. – 401K plans are exclusively offered by employers who choose retirement funds allocation and plan contribution limits. Some employers offer their employees an option of 401K contribution match up to a certain limit. – Annual contributions are tax deferred meaning you can deduct your 401K contributions on your income tax statement, you will pay taxes once you start taking distributions out. – You can start making penalty-free withdrawals upon reaching 59 ½ years of age, however mandatory withdrawals are set to occur at age 70 ½. – 401K contribution limits are statutory defined at a maximum of $16.5K per year for individuals under 50 and could be further limited by employers. If you are employed by a smaller company that does not sponsor 401K plan benefits, ask if you company offers simple IRA accounts standing for “savings incentive match plan for employees” that will still allow you to start saving for your retirement. When you decide to compare Roth IRA to 401K retirement savings plan in your particular situation, you can utilize retirement savings calculator offered by multiple retirement plan providers to verify if the retirement plans you currently have will bring optimal returns in the future.